Why the Waiting Game in Guantánamo? On Wednesday in response to a UN vote denouncing the embargo placed on Cuba by Congress the US abstained for the first time in 25 years. While this is a small nod by the US in recognition of the futility of the embargo, Congress is still opposed to lifting trade constraints until Cuba does more to improve human rights (Borger 2016). With the continuation of the U.S.’s own human rights violations on Cuban soil within its detention center in Guantánamo Bay, though, the stipulation is more than a bit hypocritical. The Platt Amendment of 1903 was an unwelcome extension within the Cuban constitution which granted the United States the right to intervene in Cuba. In return, US troops would pull out of the rest of the country. This led to the 1903 Agreement on Coaling and Naval Stations, which states that Guantánamo Bay is available to the United States “as coaling or naval stations, and for no other purpose.” A new treaty signed by President Franklin D. Roosevelt in 1934 allows the U.S. presence in Guantánamo Bay until its election to abandon it or until both Cuba and the U.S. agree on any modifications – there is again no mention of the right to run a prison camp on the land (Cohn 2015). In his meeting with President Obama this year, Cuban president Raúl Castro clearly defined two obstacles facing the normalization of relations between the two countries; one being the end of the embargo on Cuba and the other the relinquishment of the “illegally occupied” naval base (Lamothe and Gibbons-Neff 2016). But the Guantánamo Bay detention center has remained a dark shadow looming in the southern part of the bay. Since its creation the prison has seen nearly 800 people and nine deaths – of those seven being suicides (Schuppe 2016). Only eight of the men held in Gitmo were ever tried and actually convicted of war crimes (Cohn 2015). This can only further provoke the idea that the prison does not exist to impose justice for committed crimes, but rather to gather information through interrogations (Belaza 2011). The files from Guantánamo Bay released through WikiLeaks revealing grotesque counts of human rights violations continue to be a point of international criticism today, not only among Cubans. One Cuban man, Mr. Wolfredo Alvarez, says that “the Cuban government and the Cuban people, they don’t want the American base there.” In an act of protest, the Cuban government still refuses to cash the check sent each year to retain the lease of the bay. His co-worker elaborates, “we have to show the world what is happening here, what really has happened here, that they have stolen from us a piece of land” (Garcia-Navarro 2005). Obama himself has noted the various problems with the detention facility, saying that its existence “plagues our bilateral and multilateral relationships, creates friction with governments whose nationals we detain, [and] provides cover for regimes whose detention practices we oppose” (Human Rights First 2016). So why has the detention center remained? Congress, despite President Obama’s moves to transfer detainees to detention centers on U.S. soil, continues to block progress by prohibiting the use of any funds to transfer the prisoners; however, under Article II of the Constitution, the president is granted the exclusive authority to determine where military detainees are to be held. Therefore, Congress’s ban is a clear violation of the separation of powers, and Obama actually does have the power to transfer every remaining detainee (Cohn 2015). Former Guantánamo Bay captive Jihad Diyab is a Syrian who was granted asylum in Uruguay in 2014 after spending 12 years in Guantanamo, despite never being charged (BBC News 2016). Although now released, Diyab is still fighting to regain his life; last week he spoke with reporters in the midst of his hunger strike aimed at allowing his return to his family in an Arab country. His message echoed the same one that has sadly prevailed for 14 years: “Like the United States always say in the media, ‘Human rights, human rights, human rights.’ There’s never in Guantánamo…” (Goodman 2016). While the world still expectantly awaits its closure, many, including Diyab, remain doubtful that President Obama has any intentions of doing so – “If he wants to close Guantánamo, he can. He can now. Now…He can close Guantánamo. But he coward” (Goodman 2016). Schuppe, Jon. 2016. “Guantanamo Bay: Who Are the Detainees Left at the Prison Facility?” NBC News. 23 February. Available here: http://www.nbcnews.com/news/us-news/guantanamo-bay-who-are-detainees-left-prison-facility-n524196 [Accessed 28 October 2016]. Garcia-Navarro, Lulu. 2005. “Getting the Cuban Perspective of Guantanamo Prison.” 11 November. NPR. Available here: http://www.npr.org/templates/story/story.php?storyId=5009108 [Accessed 31 October 2016]. Lamothe, Dan. Gibbons-Neff Thomas. 2016. “Cuba wants back the ‘illegally occupied’ base at Guantanamo. The U.S. isn’t budging.” The Washington Post. 21 March. Available here: https://www.washingtonpost.com/news/checkpoint/wp/2016/03/21/cuba-wants-back-the-illegally-occupied-base-at-guantanamo-the-u-s-isnt-budging/ [Accessed 31 October 2016]. Cohn, Marjorie. 2015. “Close Guantanamo and Return It to Cuba.” 13 November. TeleSur. Available here: http://www.telesurtv.net/english/opinion/Close-Guantanamo-and-Return-It-to-Cuba-20151113-0036.html [Accessed 28 October 2016]. Ceberio Belaza, Mónica. 2011. “Los abusos de Guantánamo, al descubierto”. 24 April. El Pais Internacional. Available here: http://internacional.elpais.com/internacional/2011/04/25/actualidad/1303682404_850215.html [Accessed 28 October 2016]. Human Rights First. 2016. 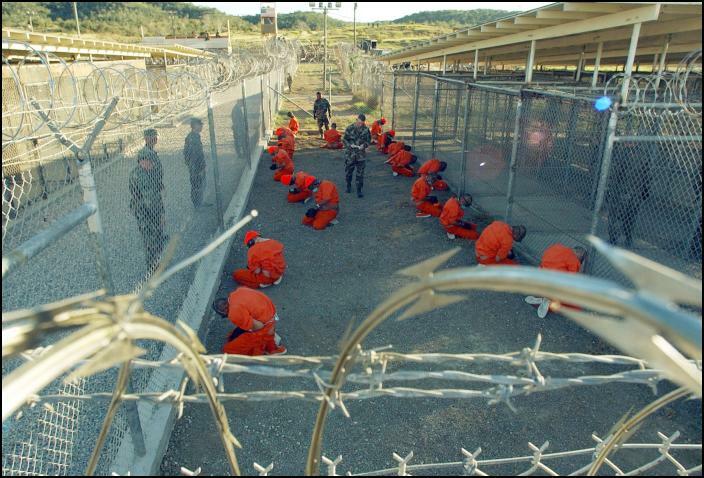 “Background on Guantanamo Bay Prison.” 21 October. Human Rights First. Available here: http://www.humanrightsfirst.org/resource/background-guantanamo-bay-prison [Accessed 31 October 2016]. Steizenmüller, Constanze. 2016. “Why the U.S. election is terrifying to this German.” 27 October. The Washington Post. Available here: https://www.washingtonpost.com/news/global-opinions/wp/2016/10/27/why-the-u-s-election-is-terrifying-to-this-german/?utm_term=.b69938ec84ea [Accessed 31 October 2016]. Borger, Julian. 2016. “US abstains from UN vote to condemn Cuba embargo for the first time.” 26 October. The Guardian. Available here: https://www.theguardian.com/world/2016/oct/26/cuba-embargo-us-abstains-united-nations-vote [Accessed 28 October 2016]. Goodman,Amy. 2016. “Exclusive: Freed Gitmo Prisoner Jihad Abu Wa’el Dhiab Speaks as Pres. Candidates to Debate terrorism.” 26 September. Democracy Now. Available here: http://www.democracynow.org/2016/9/26/exclusive_freed_gitmo_prisoner_jihad_abu [Accessed 31 October 2016]. BBC News. 2016. “Guantanamo: Former inmate Jihad Diyab ‘to leave’ Uruguay.” 23 October. BBC News Latin America. Available here: http://www.bbc.com/news/world-latin-america-37742809 [Accessed 31 October 2016].